Candy Land is under attack! Hordes of snapping cupcakes, angry bees, and jelly monsters have taken over this once sweet & tasty land. Only one man can stop this evil army of monster cakes. He’s one tough cookie, a guy who won’t crumble under the pressure,.. “Ninjabread Man” is here! Throw ninja stars to stun enemies and then follow up with Ninjabread Man’s mighty samurai sword, reducing enemies into a quivering pool of raspberry jam. Collect power ups to increase the power and range of Ninjabread Man’s weapons and use ninja skills to jump onto high ledges, dash past enemies, and find the magic candies! 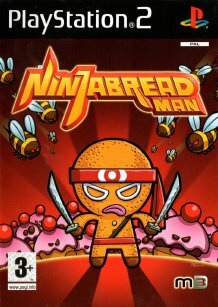 Can the Ninjabread Man save the day? Candy Land’s future depends on you!